ICanToo - 100% Light Weight Cotton Tee Cardigan with 3/4 Sleeves - Cotton Classic Cardigan Tee, made in USA. Classic styling and 100% Combed Cotton Tee Fabric combine to create a Cardigan that can be buttoned up or worn open for cooler evenings. Ultra soft Tee shirt fabric and the 3/4 slit sleeves make this classic top one you that will complete your outfit. Soft, light, colorful and easy to wear with the button front. Sits higher on the hip (about 22" length). Note that there is no flair, but this is cut straight down, with the hem circumference being just slightly larger than the bust. In Modest Women's sizes, so you may want to order up. S, M, L, XL, 2XL: See details in Size Chart. 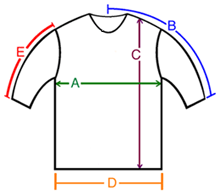 A: Chest / Bust circumference 38-39" 40-41" 43-44" 45-46" 49-50"
B: Sleeve length from center of neck to end of sleeve 25" 26" 27" 27" 28.5"
C: Body length from shoulder to bottom of hem 22" 22" 22" 23.5" 24"
D: Hem circumference 39" 42" 45" 48" 50"
E: Sleeve length from shoulder to end of sleeve 17.5" 18" 18" 18.5" 19.5"